When I first published this post last year I blithely commented that the next time I visited England I'd visit the carrot museum. Well, as this goes up I'm trotting about that fair isle, but since realized it's digital! (Mild embarrassment there.) All of that aside, this is a recipe I regularly serve and savor. It's so satisfying to use the whole plant, even though I don't mind turning things over to my friends in the compost bin. Munch away! A friend once observed that I have an almost absurd penchant for purple vegetables. Purple cabbage is (or at least was in America) a regular ingredient in our salads. Beets are a favorite in any way, shape, or form, although beet caviar remains my favorite version. Purple basil - also known as Opal - has found it's way into my garden or flowerpots regularly, and the purple bloom of bergamont is rather tasty, too. 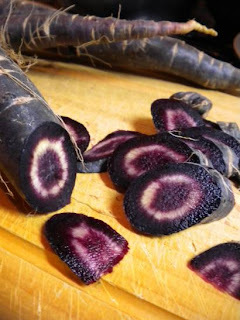 So, it's no surprise that on a visit to the Ebisu Farmer's Market when I spotted a display of purple carrots I veritably dashed over for a closer look. So dark they almost looked black, they stood in stark contrast to their lush green tops. Their orange neighbor carrots seemed rather dull in comparison. If their earthier taste wasn't enough to sell me, it was their appearance upon slicing that really took my breath away: a center burst of white surrounded by deep purple. 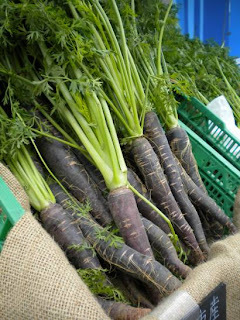 According to The Carrot Museum website, the first known cultivated carrots came from Afghanistan and were purple. Orange didn't come on the scene until sometime in the 1500's, and by then yellow and red carrots were also available. This particular cultivar may not be quite that old, but I like to imagine it's forebears made their way here on assorted trade vessels long ago. As a root vegetable, I presume it traveled well, and would been one of the few "fresh" things sailors might have eaten. As the title suggests, though, the greens also got my attention. Usually, I simply cut them off and send them off to the compost bin. But these seemed so verdant and I noticed as I moved them about they gave off a scent reminiscent of shungiku. Could it be? Any other deep green green is deemed incredibly edible, good for you, and profoundly delicious. Our garden and menu often includes kale, komatsuna, shungiku, spinach, broccoli (even the leaves), and others of that ilk. More and more studies show that leafy green vegetables arebeneficial in a variety of ways (fending off diabetes and assorted cancers, maintaining vision, staving off heart disease and high blood pressure, great sources of calcium, etc., etc.) and that anywhere from five to 25 cups of them (as well as other fruits and vegetables) need to be eaten in a day. (Check out this great alternative food pyramid from the University of Michigan. More attractive than it's government counterpart, it's also more sensible.) For me, these are all side benefits of the fact that they are incredibly tasty. I liked the idea, too, of using all of a plant and leaving nothing to waste. (I'm channeling Emma Cooper here, perhaps, whose book The Alternative Kitchen Garden I reviewed.) The leaves, again according to The Carrot Museum in the UK (a next vacation destination if ever there was one! ), are edible, nutritious, and full of everything a body needs. I fingered these lovely leaves thoughtfully for a moment, and then decided to charge forward with a grand experiment. Why not make them just as I do Goma Ai Shungiku? Using the chrysanthemum recipe for cooking the carrot greens offered mixed results. The stems close to the carrot itself were quite thick and required a bit more cooking time. The feathery parts of the leaves and nearby stem were delicious, although they also would have benefited from a slightly longer cooking time. I would suggest cooking them for 90 seconds or even a full two minutes. I'll be trying this again, and will post results of future experiments. Darya Pino over at Summer Tomato wrote this piece on the myth of super foods that offers good advice for thinking of food as not just nutrients, but as food and the power of eating a diverse diet of whole foods.